Granzymes, a family of serine proteases, are expressed exclusively by cytotoxic T lymphocytes and natural killer (NK) cells, components of the immune system that protect higher organisms against viral infection and cellular transformation. Following receptor-mediated conjugate formation between a granzyme-containing cell and an infected or transformed target cell, granzymes enter the target cell via endocytosis and induce apoptosis. Granzyme B is the most powerful pro-apoptotic member of the granzyme family. Like caspases, cysteine proteases that play an important role in apoptosis, it can cleave proteins after acidic residues, especially aspartic acid. Other granzymes may serve additional functions, and some may not induce apoptosis. Granzymes have been well characterized only in human and rodents, and can be grouped into three subfamilies according to substrate specificity: members of the granzyme family that have enzymatic activity similar to the serine protease chymotrypsin are encoded by a gene cluster termed the 'chymase locus'; granzymes with trypsin-like specificities are encoded by the 'tryptase locus'; and a third subfamily cleaves after unbranched hydrophobic residues, especially methionine, and is encoded by the 'Met-ase locus'. All granzymes are synthesized as zymogens and, after clipping of the leader peptide, maximal enzymatic activity is achieved by removal of an amino-terminal dipeptide. They can all be blocked by serine protease inhibitors, and a new group of inhibitors has recently been identified - serpins, some of which are specific for granzymes. Future studies of serpins may bring insights into how cells that synthesize granzymes are protected from inadvertent cell suicide. 'Granule enzymes' or 'granzymes'  comprise about 90% of the mass of cytolytic granules, specialized 'secretory' lysosomes, of both cytotoxic T lymphocytes (CTLs) and natural killer (NK) cells. The granzymes are closely related structurally to chymotrypsin, with a triad of key residues - histidine, aspartic acid and serine - conserved at the catalytic site, and they are genetically linked to other leukocyte serine proteases, especially those of mast cells and monocytes. A total of eight granzymes (A-G and M) have been identified in the mouse, but only five are known in humans (A, B, H, M and tryptase-2, which is also known as granzyme 3). No human equivalents of mouse granzymes C-G are known, and granzyme H appears to be specifically human (Table 1). *Granzyme A is the only granzyme that is found as a homodimer and its relative molecular mass (Mr) is therefore higher. All granzyme genes are similarly organized, and their transcripts are made up from five exons, with the first encoding the leader sequence while exons 2, 3 and 5 encode individual amino acids of the catalytic triad (Figure 1). Although most other granzyme genes encode only one transcript, two granzyme A mRNAs arise from alternative splicing of different exons 1. Organization of the human granzyme B gene. The gene is approximately 3.2 kb in length and is presented as a prototype of granzyme gene organization. A TATA box consensus sequence (T) is present approximately 30 bp from the initiation site for transcription. The five exons are indicated by Roman numerals. Exon I codes for the leader sequence. Exon II contains the start of the mature protein (highly conserved as IIGG (in the single-letter amino-acid code) in most granzymes) and encodes the first of the essential catalytic triad of residues at the active site, histidine (H). Exon III encodes the aspartic acid (D), and exon V the other essential catalytic residue, serine (S). The side chain of an Arg226 (R) forms the base of the substrate pocket and forms a salt bridge with aspartic acid at the P1 position of the substrate. The polyadenylation signal is shown as P. The lengths of the exons and introns of the human granzyme B gene are also shown in base-pairs, although these show minor variations between different granzyme genes. The 5' untranslated sequence is shaded. Gene-mapping studies indicate that the three human and mouse granzyme subfamilies map to three corresponding loci, with each subfamily seeming to have a single, broad substrate specificity (Table 2). Mapping of the rat genes has not been reported. The genes encoding human granzymes A (HFSP) and tryptase-2 (TRYP2) map to chromosome 5q11-q12 . Granzymes B and H map to a cluster of serine protease genes at 14q11, which includes the gene for the protease cathepsin G, which is specific for myeloid cells . The granzyme M gene is located with the genes encoding azurocidin (AZU), neutrophil elastase (NE) and proteinase-3 (PR3) on chromosome 19p13.3 [2,4]. In the mouse, the corresponding loci are chromosomes 10 for granzyme A and other tryptases, 14D (for granzymes B-F) and 10C (for granzyme M, AZU and NE). *Granzymes D and G have not been definitively mapped, but are highly homologous to granzymes E and B, respectively. Overall, the granzyme subfamilies have trypsin-like, chymotrypsin-like and elastase-like specificities, and their genes are grouped in the 'tryptase' locus, the 'chymase' locus and the 'Met-ase' locus, respectively (Table 2) . These clusters of genes have their own peculiarities. For example, in mouse and human the granzyme M gene, AZU and PR3 each have intron 1 located between residues -7 and -6 of the leader sequence, indicating a close evolutionary relationship. In human, the genes encoding granzymes B and H and cathepsin G are very closely linked, mapping to within 50 kb of each other. The granzyme H gene is located between the other two genes, and appears to have arisen as a 'hybrid' made up of the first three exons and intervening introns of the granzyme B gene and the remainder of another serine protease gene. Generation of the hybrid might have been followed by the accumulation of point mutations. Mouse, rat and human granzymes B are about 70% identical at the amino acid level, while granzymes within any one subfamily (for example, granzymes B and C in the mouse) are 55-70% identical. By contrast, amino-acid sequence identity drops to approximately 30-40% when one compares granzymes from different subfamilies, such as granzymes A and B (37%), even within the same species. Although granzymes probably occur in other species that have complex immune systems (for example, in birds), unfortunately to date granzyme sequences have only been reported in mammals. As with other serine proteases, the catalytic activity of granzymes depends on a serine residue at the active site, one of a triad of residues corresponding to His57, Asp102 and Ser195 in chymotrypsin . Other features include an oxyanion hole to stabilize transition states of the enzyme-substrate complex and a substrate-binding pocket, the shape of which determines the protease's specificity. The crystallographic structure of rat granzyme B was recently determined . The crystal structure held few surprises. It was demonstrated that the substrate cleft of granzyme B is quite capacious, and as many as eight substrate residues can be accommodated. The key residue for contact with the P1 substrate residue (that is, the amino acid that is amino-terminal to the cleaved bond, usually aspartic acid) is Arg226 (Figure 2). Molecular determination of substrate specificity in the granzyme B crystal structure. (a) Two granzyme B molecules (green) are complexed with a dimer of the inhibitor ecotin (dark and light blue). The key residues at the catalytic site of granzyme B are labeled using orange atoms. (b) The catalytic site of granzyme B is shown as a 2.2Å electron density map, with the primary determinant of substrate specificity, Arg226 (green), held by three hydrogen bonds (from Gln217 and Ser221); the substrate aspartic acid is shown in blue. Reproduced with permission from . Granzymes are synthesized as zymogens that are processed at the time of packaging into cytolytic granules. Cleavage of the leader peptide leaves two amino acids attached at the mature amino terminus, which are then clipped off by dipeptidyl peptidase I (DPPI, also called cathepsin C), a peptidase constitutively expressed in lysosomes . Granzymes become enzymatically active once the amino-terminal dipeptide is cleaved; the pH optimum of granzymes is approximately 7.5, so they are maximally active following release from the secretory granules into the cytoplasm (pH around 7). DPPI is a key regulator of granzyme function, and DPPI-deficient mice have little or no granzyme activity. Expression of wild-type granzymes in cells lacking DPPI results in the production of inactive granzyme protein. Granzymes can be expressed in such cells, however, if the activation dipeptide is deleted. 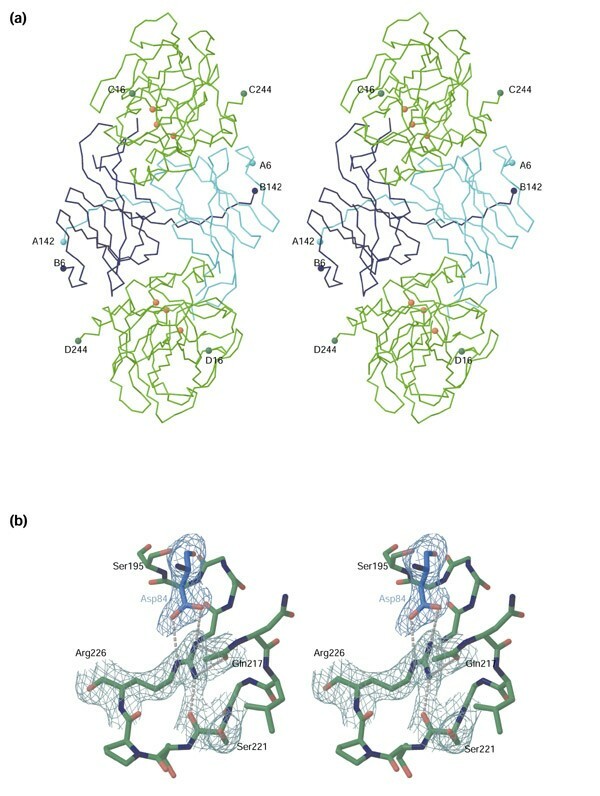 Granzymes A and B are adorned with mannose-6-phosphate moieties for packaging through the mannose-6-phosphate receptor pathway , shown to be the case for both human and rodent granzymes. A minority of the granzyme protein is packaged by a mannose-6-phosphate-independent process, however. Granzymes also undergo variable N-linked glycosylation. Mouse granzyme C has few glycosylated residues, whereas, at the other extreme, half of the molecular mass of granzyme D is made up of carbohydrates added to five sites. Granzymes are similar to other chymotrypsin-like enzymes but also have several defining characteristics. The residues at positions 1-4 (typically Ile-Ile-Gly-Gly) and 9-16 are highly conserved in all granzymes of both human and rodents. Their propeptide sequence is generally Gly-Glu or Glu-Glu. They generally have three conserved disulfide bridges, although granzymes A and M and tryptase-2 have four. Granzyme A is the only granzyme that is found as a dimer, as a result of interchain disulfide bonding. The expression of granzymes is restricted to activated T lymphocytes, immature T cells in the thymus (thymocytes), γδ T cells (a small population of specialized T cells mainly found in the gut) and NK cells. Of these, NK cells and γδ T cells constitutively express and store granzymes, whereas in T lymphocytes the production of granzyme mRNA and proteins must be induced following exposure to antigen or following other types of stimulation. Granzymes are expressed by most CD8+ and a smaller proportion of CD4+ T cells sensitized in vitro by antigen or lectin . The gene for granzyme M is only expressed in NK cells, whereas other members of the subfamily encoded by the Met-ase locus have a much wider expression. Granzymes undergo their final processing by DPP1 at the time of packaging into cytotoxic granules, and they are therefore stored as active enzymes, ready for exocytic release upon contact with a target cell. The granules have two zones, which can be seen at the ultrastructural level. Each has a dense central core, which contains granzymes, the granule toxin perforin and the acidic proteoglycan chondroitin sulphate (CS). The net negative charge of CS enables it to complex granzymes, which are basic and positively charged at granule pH. The outer zone of each granule has a composition more typical of an ordinary lysosome. Granules appear to be distributed randomly in the cytoplasm, but they rapidly move to the site of target-cell contact when conjugation occurs, in a process known as polarization. It is clear that the principal function of granzymes is to induce the death of virus-infected and other potentially harmful cells. They achieve this by accessing key substrates within target cells in a perforin-dependent manner. Perforin-deficient mice thus have a complete deficiency of all granzyme-mediated cell-death pathways and are susceptible to both a broad variety of viral pathogens and other intracellular pathogens, such as Listeria monocytogenes . Granzyme B has the strongest apoptotic activity of all granzymes, as a result of its caspase-like ability to cleave substrates at key aspartic acid residues. But mice deficient in granzyme B expression have a far milder immune deficiency than perforin-null mice, suggesting that there is a degree of functional redundancy in granzyme-induced apoptosis. In vitro, the CTLs of granzyme B-deficient mice induce DNA fragmentation in target cells much more slowly than do CTLs of wild-type littermates . Granzymes other than B have far weaker apoptotic activity, best illustrated by granzyme A, a tryptase that can amplify granzyme-B-mediated cell death. Granzyme A can induce caspase activation far less efficiently than granzyme B, and exerts other pro-apoptotic effects through its ability to cleave down-stream caspase substrates. The cell-death-inducing properties of granzyme B have recently been studied in detail. Granzyme B can cleave, and therefore activate, several procaspases directly, and can also directly cleave downstream caspase substrates, including the inhibitor of caspase-activated DNase (ICAD). It can thus contribute in a major way to DNA fragmentation in the target cell. Overexpression of the anti-apoptotic Bcl-2 protein in mitochondria inhibits granzyme B completely, however, indicating that mitochondrial disruption is an indispensable feature of granzyme-mediated cell death . Recently, we have shown that in human and mouse cells the pro-apoptotic Bcl-2-family member Bid is cleaved specifically and rapidly by granzyme B distal to the aspartic acid residue at position 75, and that the truncated Bid molecule inserts into the mitochondrial membrane to induce the release of other pro-apoptotic mediators, including cytochrome c and Smac/Diablo . In addition to caspase-dependent mechanisms, there are also caspase-independent pathways: cells in which caspase activity is abolished are nevertheless killed by granzymes, although the caspase-independent mechanisms are poorly understood but probably involve cytoskeletal disruption (Figure 3). A schematic model of granzyme-B-mediated apoptosis. Granzyme B enters the target cell by endocytosis and leaves the endosomal compartment to access the cytosol in a perforin-dependent manner. The key cytosolic substrate for granzyme B is the pro-apoptotic Bcl-2 family member Bid, which is cleaved distal to aspartic acid at position 75. Truncated Bid (tBid) induces mitochondrial disruption, which can be inhibited by Bcl-2. 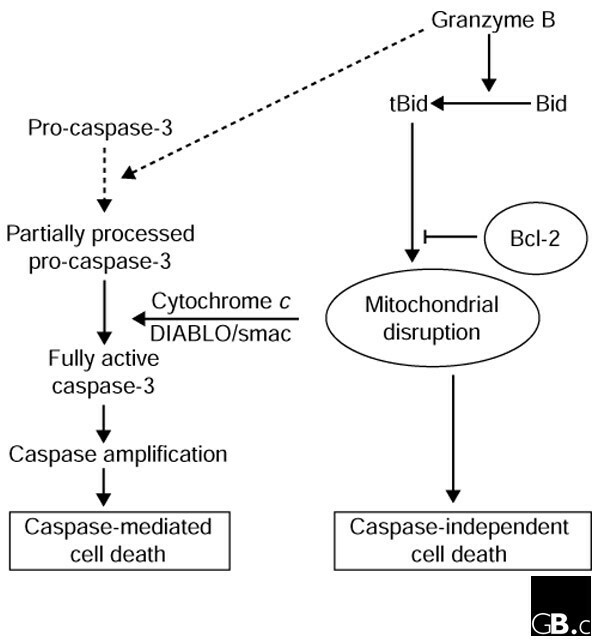 Disrupted mitochondria release other pro-apoptotic mediators such as cytochrome c and DIABLO/Smac, which subsequently induce caspase activation. Granzyme B also cleaves some caspases directly, but full caspase processing requires activation of the mitochondrial pathway through Bid. There are also caspase-independent pathways to cell death, and although they are poorly characterized, an important step in these pathways appears to be cytoskeletal disruption. A number of additional functions have also been postulated for granzymes, especially for the trypsin-like granzyme A, which may be involved in regulating B-cell proliferation. Purified mouse granzyme A can be mitogenic for B cells in the absence of antigen, much like other 'tryptases' such as thrombin and trypsin. Granzyme A can cleave a number of extracellular matrix proteins, and thus may facilitate migration of T and NK cells through extracellular tissues. Granzymes can also induce cytokine secretion and directly activate certain cytokines, and may thus amplify some forms of inflammation. Granzyme A can cleave the thrombin receptor after the sequence Leu-Asp-Pro-Arg to induce the release of the interleukins IL-6 and IL-8 from monocytoid cells and the retraction of neurites in oligodendrocytes. A role for granzymes A and B in directly controlling viral infection has been proposed, because mice with a targeted disruption of the genes for granzymes A and B were found to be profoundly susceptible to infection with the cytopathic orthopox virus, ectromelia . Despite this, granzyme A-deficient mice are capable of a normal response to the noncytopathic lymphocytic choriomeningitis virus (LCMV) and to the intracellular bacterial pathogen Listeria monocytogenes, and they can eradicate several syngeneic tumors with kinetics similar to wild-type littermates. Granzymes have very specific substrate preferences, consistent with their role as processing, rather than degradative, enzymes. Digestive proteases, such as trypsin, chymotrypsin and elastase, have a very broad range of substrates, and the amino-acid context of the P1 residue of substrates is far less critical than for granzymes, for which up to five residues neighboring the P1 position may influence recognition and cleavage. Clear substrate preferences have been identified for granzymes A and D and tryptase-2 (all of these are tryptases; these are often defined by their ability to cleave Na-CBZ-L-lysine thiobenzyl ester) and for granzyme B (an 'Asp-ase', cleaving at aspartic acid and possibly glutamic acid), granzyme M (also known as 'Met-ase' and cleaving at methionine) and granzyme H (a chymase). Granzyme B is the only mammalian serine protease that prefers acidic side chains , a finding of relevance for its role as a pro-apoptotic enzyme as it allows cleavage of Bid and the pro-caspases. Various synthetic compounds, including peptide thiobenzyl ester, 7-amino-4-methylcoumarin and paranitroanilide (pNA) derivatives, have been tested to determine optimal substrates and cleavage conditions for granzymes. The optimal paranitroanilide substrates are D-Pro-Phe-Arg-pNA for mouse granzyme A and tosyl-Gly-Pro-Arg-pNA for human granzyme A. Both mouse and human granzymes A are inhibited by serine protease inhibitors such as di-isopropylfluorophosphate, phenylmethylsulfonylfluoride, bezamidine, aprotinin, leupeptin and soybean trypsin inhibitor. In addition, granzyme A of both species can be blocked by a number of physiological inhibitors, such as α2-macroglobulin, antithrombin III and C1 esterase inhibitor, which may protect surrounding tissues from bystander damage following degranulation . Many granzyme A inhibitors inhibit granzyme B only marginally. In one extensive study, the best inhibitor identified was human α1-protease inhibitor, which produced 85% inhibition when used at 10 μg/ml . It has recently become clear that cytotoxic lymphocytes synthesize their own inhibitors (serpins) that act in the cytosol to bind and neutralize mis-sorted or mis-packaged granzymes. Serpin PI-9, expressed in CTLs and NK cells, has glutamic acid as its P1 residue, and this choice (over aspartic acid) influences its capacity to inhibit granzyme B specifically. Bird and colleagues  showed that mutating the P1 residue to aspartic acid resulted in poor complex formation with granzyme B, and that the mutated molecule became capable of inhibiting caspases, unlike wild-type PI-9. Kinetic studies indicate that substituting aspartic acid for glutamic acid results in the mutated PI-9 molecule becoming a far better substrate for granzyme B, with a much faster off rate. As serpins act as pseudosubstrates and exert their inhibitory effects by irreversibly binding the protease following cleavage of their inhibitory loop, replacement of aspartic acid with glutamic acid paradoxically results in poor complex formation and poor inhibition. In cells, PI-9 is absent from cytotoxic granules but present in high concentrations in the cytosol. It can therefore block potentially toxic granzyme B molecules that leak out of CTL granules, without inhibiting caspase-dependent death of the CTL occurring through the Fas pathway . Many new intracellular serpins have recently been described, and it is possible that CTLs and NK cells protect themselves with serpins specific for each of their granzymes. Despite their biological importance, granzymes are still relatively poorly studied and many important questions remain to be answered. The nature of the synergy between perforin and granzyme - that is, the mechanism by which granzymes are released from the target cell's endosomes - remains poorly understood. Caspase-independent cell-death pathways are very important, because they allow CTLs to kill cells in which caspases have been blocked by viral inhibitors, such as the cytokine response modifier A (crmA) expressed by poxviruses. Again, the nature of these pathways has not been elucidated. Granzymes other than A and B doubtless have many functions other than in apoptosis, and the generation of further gene knockout mice should help to cast light on this area of research. It will also be fascinating to learn more about the regulation of granzyme function mediated by novel serpins. These studies could have major implications for our understanding of immune homeostasis (for example. the regulation of CTL numbers following an infection), and of effector responses to viral disease and cancer. The author is a Principal Research Fellow of the National Health and Medical Research Council of Australia, and is supported by project grants from NHMRC and the Anti-Cancer Council of Victoria.